Over 40 fun-filled story-vignettes starring the Shushies! 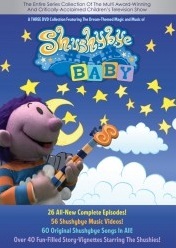 Shushybye is an original preschool entertainment and lifestyle brand, encompassing a national television series, national radio show, Video On Demand programming, series of bedtime storybooks, toys and plush dolls, music CDs, DVDs and sleepwear. Shushybye is all about dreams…dreams made especially for children by the Shushies who live in Shushybye villages such as Nap Valley, Snore Shore and Slumber Heights. But children have to go to bed on time in order to get their Shushybye dreams (i.e. when Mommy tells them!). Children make their Dream Wish before they go to sleep. The Shushies make all their dreams then place them in Dream Boxes. Conductor McCloud puts the Dream Boxes on the Shushybye Train and transports them to children as they fall asleep on time." What we thought: This is a really cute DVD and would be great as part of a bedtime routine. They are relaxing and mellow and if you have younger children, they are sure to enjoy the Shushies:) ABCD Diaries gives this DVD an A+! Disclosure: ABCD Diaries was given a copy for review purposes only. We were in no other way compensated. The opinions expressed in this post are ours and ours alone.